We, Naeem Marketers are highly reputed dealer and supplier of fasteners, industrial fasteners, precision fasteners and washers, which procured from highly reputed companies to ensure the quality of products. 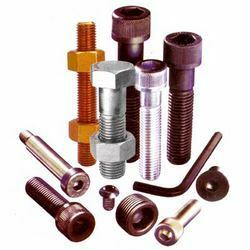 Our company is an authorised dealer and supplier of Deepak Fasteners Limited. We also supply various range of High Tensile fasteners. Our products range in which we deal is Bolts, Nuts, Washers, Studs and Foundation Bolts in standards such as DIN/BS/ASTM/ANSI/ISO. Naeem Marketers also supply High Strength Friction Grip (HSFG) Bolts, Nuts and Washers according to DIN 6914, DIN 6915 and DIN 6916. We, Naeem Marketers are highly established and reputed dealer and distributor of Shuttering and Mould Oil, Precision Measuring Instruments, Pipes and Fittings, Fasteners and Hydraulic Jack of well-known companies. Our company procure these products from those companies who are an ISO 9000 certified and having a major share in the market with excellent quality products and services at a customized rate. These brands are highly accepted over the years by many big and small companies, which are I C F Ltd. L and T, Hyundai Motor Ltd, Hindustan Construction Co. Ltd, (HCCL), Britannia Industries Ltd, Reliance Industries Ltd, Indians Additives Ltd, Etc. Apart from these products our company also deals in PVC, GI, SS, MS Pipes and Fittings, All kinds of Fasteners, Asbsetos Jointing and Packings, Safety quipments, all types of Valves and Fittings and other general hardwares. Our company also undertake fabrication work as per specification and requirements of clients. We are also distributor of Shuttering Oil for MS and Wooden Mould Oil for RCC Spun Pipe Moulds.